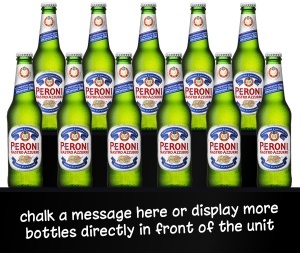 This two level retail display unit is perfect for pubs, restaurants and other licensed outlets who wish to promote wine, beer, spirits or various other products at eye level behind the bar or for other retail outlets wishing to display freestanding items. 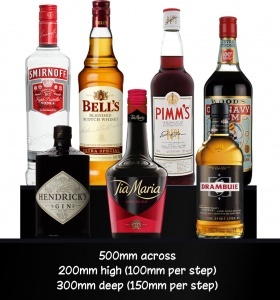 Primarily designed for bars and restaurants, these steps sit behind the bar and allow you to place bottles at three levels to create an attractive stacked formation that promotes either single or multiple brands. 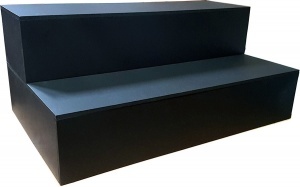 The steps are made from timber and MDF board coated in a high quality matt black finish suitable for chalking price and product information if required. The top level is detachable so can be placed in a separate location to the bottom level if required or can be placed on top to create a two tier retail display that is 50cm in length and with a total depth of 30cm. Each level is 15cm deep which provides plenty of room for bottles and jars. The total height of the unit is 20cm (10cm per step). If these sizes aren't what you are looking for we can make a bespoke unit to your desired specifications. Please call us for a quote. These retail display steps are a great way to promote all types of products at point of sale, exhibitions or shop floors. Wholesale and bulk buy discounts may be available on these retail display steps subject to your required quantity. Please call us to enquire.